Joanie Stahl shared a recent dream where she found herself walking through an end times scenario in America. In the beginning of the dream she encounters innocent children and was caring for a newborn, then later the dream takes a turn when she finds herself running for her life to escape from people hunting her and her family down. Walmart was part of her dream, and it has been a topic I have been meaning to investigate. 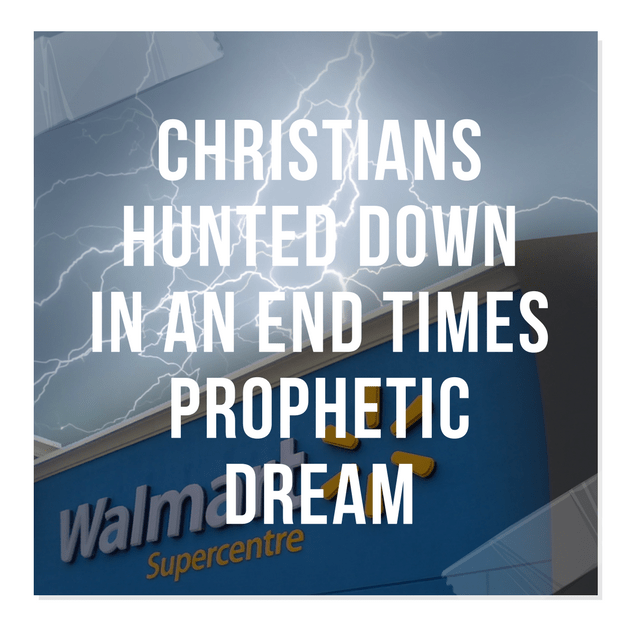 There have been others who also have seen walmart come to play in their dreams as a staging place for Fema camps, which is what Joanie mentions in her dream. Erica posted on Steve Quayle’s dreams and visions page of an end times scenario where she also saw Walmart stores being hollowed out and used as a sort of detention or human sorting facility. She mentions Walmart, and not just any big box store. In addition she also sees different aircraft flying over the United States which Joanie mentions in her dream as well. Erica makes a note that what she saw was not military aircraft, but rather standard passenger or freight planes. She then sees paratroopers jumping out of the planes. She identified the paratroopers having a Russian in appearance. These are the only Walmart dreams I have written down, however many more exist that I would like to go through. Both dreams have almost identical themes in them. The aspect of hunting down Christians has been told in many other dreams that I also trust are true. In the above word by Patricia Green, one of the signs that will occur before the great persecution begins is that they will remove “In God We Trust” from the US currency. End Time Vision From Maurice Sklar – The Mark Of The Beast . 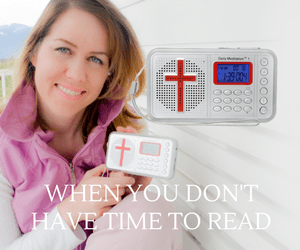 Ken Peters also describes a time in the future which he identifies as the tribulation where there is a demonic drive or mentality that causes people to want to search and kill believers. It is a level of hatred that only can be demonically lead. You can read about it in the link above. Vaccines also may have to do with this change of mind. In the link below, new reports reveal that the newer vaccines change the make up of your DNA. The mark may play into the shift in mindset in those who were hunting down Joanie in her dream. Below is Joanie’s dream. Read how much of what she saw has been confirmed by other prophetic voices. Last night I had two dreams in a row. The first one was horrifying and my explanation and description of them will not do it justice. I will just jump right into them and I will not add any interpretation to it as I just received these dreams and need to take it back to the Lord who gave them. In the beginning of this dream I immediately saw myself laying in bed and then waking up. It was apparent that Jon (my husband) and I were staying somewhere like a hotel or something. It was clear that we were not at home. I got out of bed and looked around to see where he was and he was out in the living room. so I went out there. I saw a little baby with him. In dreams given to me by the Lord, I am ever present tense. I am 100% cognisantly aware as if I were not in a dream. I looked at this little baby knowing that we do not have a baby. yet the baby was with us. The baby was crying a bit because it was hungry. Being that I know that we do not have a baby in real time I realized that we did not have anything to feed it. (I say it, only because I did not know whether it was a boy or girl). I felt frustrated that I was in this position having nothing to give the baby. I then said in a kind of frustrated tone that I would then go out to the store to get some formula for it. Next scene I see myself walking into a Walmart. I walked in and it was like any normal day, with people shopping and life as usual. I walked past a Walmart greeter. He was obviously a retired older man wearing the unmistakable little blue vest. He was a happy man, singing a little song to a group of little children. The little children stood around him as he sang. I thought it was sweet. I needed to use the restroom first before I started shopping, so I went into the bathrooms. I looked and saw that it was full and I had to wait, so I went back out to stand around and wait. I went back out where the greeter was because the restrooms were located near where he was. I tried to tell him I could not wait and did not want to wait, that I was busy, but he took off in a hurry. I then went back into the restrooms and noticed everything had changed. The bathroom was enormous now and there were no longer private stalls. There were different kind of stalls though, meaning, that when I opened one door to a stall, there were multiple toilets. The doors were half sized so there was no longer any privacy. I noticed that everything was filthy. I went into use one of the toilets and a little girl came to talk to me from the other side. She was little and spoke to me even in this compromising position, but her innocency made it okay, what could I do? She spoke to me about little girl things and while she spoke to me, what stuck out to me were her eyes, the pure innocency of childhood. That brought alarm to me because each and every second I could feel that something very bad had happened, and was increasingly happening in a very bad way. The little girl’s mother came and took her away and I left the stall and stepped out knowing I had to get out of there in a hurry. I then saw a large group of young African girls come in with a woman I knew not to be their mother, but some sort of guardian. There was a man with them who I knew to be an authority over her. The woman disappeared into the back area of the restrooms. He went to use the restroom too. I thought while I was in there that the bathroom looked like something in a FEMA camp. How I knew to say that I do not know. But in my dream I knew what I was looking at. This restroom was now for all people. I knew that what was happening was escalating rapidly and I had to get out of there in big hurry. I knew that time was of the essence. I felt somewhat afraid of him at that point and did as he said. Then as I was swallowing the bit of cake I noticed his countenance changed again, and a look came over his eyes, as if something was removed and he can see better. He narrowed his eyes and it felt as if he could look right through me. He then looked at me with a wicked hatred, a murderous hatred, and I knew in that moment, it was because I was a Christian. I was afraid of how to get away not knowing what he would do. He clearly was no longer himself, it was as if something took him over. It was totally evident. As I was wondering how to get away, a man came out of nowhere that appeared to be a manager and whisked him away telling him he was needed elsewhere, and he looked so angry because he had to leave me. Because I knew somehow he wanted to do something destructive to me. As soon as I left the store I saw a young girl who had come out as well. She looked to be about 10 years old or so. I noticed that she had a T-shirt on with Jewish words not written on it. Not in Hebrew but in English. Words like shalom, Tribe of Judah, and other words I am familiar with. She turned to look at me and she was happy, not knowing what was happening. She approached me and asked, “Hey do you want to come with us? You can have one of these T-shirts.” I immediately became afraid knowing that if I took one of those shirts and wore it, that would make me a direct target. I declined and she left. I then saw my husband and son waiting for me in the parking lot. I got in the car with them, Jon was driving, my son in the back seat, and of course me in the passenger seat. It was now dark. The car we were driving had a sun roof, and as Jon drove I looked up in the sky and thought that the sky looked very strange, different not normal. The stars were not the same, everything had shifted into abnormality. I said to my son, “Hey look at the sky. notice how strange and bizarre even the stars look!” As I said that I noticed something streaking across the sky. I said, “Hey, look a shooting star!” I did not even finish that sentence when I saw the entire sky now filled up with what looked like shooting stars. But they were not shooting stars. I noticed from every direction what appeared to be shooting stars were some kind of gallactic fleet of aircraft. The speed in which they traveled was frightening because there is nothing like that I had ever seen. I saw them all meet up and they joined together and hovered above us. They were very high up not right above us, but above the atmosphere of the earth. When they all arrived together, they then vanished instantly. When that happened I knew that was a very bad sign. Traffic was stopped so we could not drive to get away. I then noticed in the near distance behind the trees was a light that I knew had something to do with that fleet of aircraft. It hovered behind the trees and it was a light that was changing colors from purple, to blue, the yellow and green in an undulating way. I could feel a wicked, and violent intelligence coming from it and I knew it was directed towards me and it was coming closer and closer. I yelled out to Jon, “Jon, get out of the car, everybody get out of the car! We cannot stay in the car we have to go!” We got out of the car and I realized we had our dog with us. I immediately felt a complete thickness of the utmost violent evil all around us. I knew by that atmosphere that everything had changed. I looked around and saw everyone outside of their houses standing around, walking around in a crazy, beligerant, restless manner in the streets and sidewalks. Not one person was in their homes. Though it was dark I was able to clearly see the look on their faces and the look they all had were like wild, rabid animals. They all were what appeared to be demon possessed and bestial. I knew that if we ran we would be seen of them and there was no doubt in my mind that they would murder us. No doubt. As we went on walking as fast as I could I was carrying my dog. She is a heavy dog weighing 40 lbs, so clearly, I had a kind of strength I do not normally have. It was horrifying because I knew that there was no longer any more safety and there was nowhere anyone could hide. I noticed as we were walking as fast as we could, dogs. Dogs were out and roaming the streets everywhere as if they were hunting. I could clearly see the face of the dogs and they too had the same wild, demonic look on their faces of evil and murder. There were some medium size dogs, but mostly all big ones. I knew that the reason there were no small dogs is because the bigger ones had devoured them. Everyone including the dogs had the same animal/beast persona. I knew also as I was constantly watching the people and the dogs that they were not killing for food, but for the fun of it, the wicked fun of it in the most devilish way. They were even laughing a horrible laughter. As we got closer to where we would finally arrive at, I noticed something else. I started seeing what looked like black gorillas. I knew that that could not be so, because how could there be gorillas in the area that we were at which was a big city. Again, though it was dark, I could see them as well as I did the people and dogs. I looked closer and saw that they were not gorillas but some kind of demonic creature like beasts, denizens of hell. They were appearing everywhere among the people. They traveled in pairs or alone. They would randomly leap on an unsuspecting person. They would leap on them and overcome them. What I saw next was beyond description. Those wicked creature beasts were tearing the flesh off the people, tearing their limbs off, and tearing their whole bodies in half and the sound of the person was so beyond horrific there is no way I could convey what they sounded like. Other people around them were oblivious to the carnage and made light of it. All the people had what I saw a devilish joy in it. Like they got off on it, (for lack of a better term), like they fed off of it. We finally made it to an area that I knew we were only yards from a location I knew to go to. How I knew I do not know. We crossed the street and made it to a grassy area, and as soon as we did, a huge dog came right up to us and stood right in front of me inches away. I told Jon and my son to stop and not to move a muscle. The dog was so big the top of his head was as high as my hip. I looked right into it’s face, into it’s eyes, and it was not just a rabid dog, no, it was possessed with an evil spirit. It had intelligence. I knew by looking at it’s face and eyes that it was confused. Because it could not figure out why it could not attack me or us. It was fixated on our dog in my arms. It wanted to kill our dog so bad, but it could not. As we stood there, I began to notice people surrounding us. I saw them crossing the street to come to see us. They were coming from every direction. I knew by looking at their faces that they knew we were Christians and they were going to kill us. He ran in and Jon, my son and dog stood behind me as I tried with all my might to force the door closed while men were on the other side trying to force it open. Again, there was no way humanly speaking that I should have forced the door shut alone with all men on the other side trying to force it closed. But I did and locked the lock on the door knob as well as a slide lock. I could hear the men on the other side trying to get in and I even knew one of them had keys to the door because I could hear the keys going into the door lock. I turned to look behind me and my family was standing in the middle of the room. I looked past them and saw nothing but wrap around windows which were in the front. The curtains were wide open and the blinds were up. I said to Jon, “It’s too late to try to close the blinds!” I saw hordes of men rush up to every window and then they crashed through them. They all instantly crawled into the room and we stood with our backs against the wall facing them. The men stood in front of us ready to kill us. The looks on their faces were as described above. After waking up from the first dream I was traumatized. The things I saw were too much for me to take, and I was terrified. I knew that the dream was from the Lord. I did not want to go back to sleep. Every time I started to doze off I would wake myself up. I could not stay awake any longer, I could not fight it, and went right back into a deep sleep. Immediately I saw myself standing in an area that was very much a desert place. I stood on a high bank looking out over what looked like some large, very large body of water. On the other side of it across the big body of water were many homes stretching far and wide. It was a very large dwelling place for many people. We both walked down from the high bank down a little dirt path to a road and walked for awhile and stopped not really knowing where we were at that point. Just then I saw what looked like a mass exodus of people on foot, men, women, children, and many people coming in my/our direction. I wondered about them as I saw them, what was happening? Somehow I knew in the dream that they were all the people that were fleeing from the homes I saw on the other side of the body of water. I thought to get out of their way as they approached nearer, rapidly. Like they were not just walking but literally fleeing. I looked around me trying to find a way to get out of the way of the stampeding people. I turned around and saw as little dirt path behind me and decided to go up the little dirt path that went upwards. The man that was with me went up with me, behind me. As I got to the top of another bank, I looked out and saw that same body of dead water. I heard someone from forefront of that mass exodus scream out, “Follow her! Follow her! I turned in terrific panic and started waving my hands and arms screaming back at them saying, “No! No! Do not turn in here! Stop!” But they ignored my pleading with them and they poured in like rushing water right past me. They all had the appearance of being terrified and desperate. Everyone was running as if they were running from something threatening their lives. I knew that by looking at all of them that they carried nothing with them and that told me that whatever caused them to run for their lives was sudden and instant. I looked way up ahead to where the people were migrating to along the water’s edge and saw no way out for them. They would be trapped. I pleaded more and more, but they would not listen. I was devastated because of knowing that there was no way they could survive there. I was greatly grieved beyond any measure I have ever felt as I stood there watching them rush in. Both myself and the man then stood there watching. No more words were spoken either by him or me.. Previous articleWhy Are So Many Believers Moving To The Upper North West Of The United States?